I’ve been going through the five seasons of “The Wire” lately, which is arguably the best police show ever made for television. The antecedent of “The Wire” and all other realist police procedurals is William Friedkin’s “The French Connection”. Thirty-eight years later it’s astonishingly fresh, relevant, timeless, and shows absolutely no wear or age - still the greatest cop flick ever made. The film begins in Marseilles, France. We meet Alain Charnier (Fernando Rey), a shipping stevedore under surveillance by the French authorities. He lives a classy and luxurious lifestyle on the sea side. But he’s a drug smuggler and plotting a transfer of heroin into the U.S. with the help of a French television star who will move the goods hidden in his car. 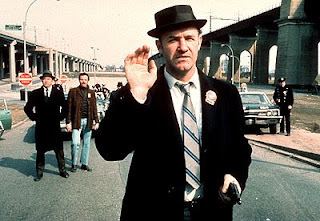 Charnier’s opponent is Popeye Doyle (Gene Hackman), the typical cinematic rogue cop - a tough as nails, blue-collar detective, always on the clock, a life of perpetual antagonism resulting in an emptiness devoid of family or friends. The film parachutes us into the middle of Doyle and his partner Buddy Russo's (Roy Scheider) undercover sting of street-level narcotics policing. While out for a drink Doyle and Russo decide to tail a new high roller to the drug pusher scene. Wiretapping and other street level surveillance reveal the connection between Doyle's drug peddlers and their legendary French sources of NYC heroin. As the cat and mouse games progress so does Doyle’s obsessiveness with catching Charnier. Friedkin’s background in documentary and a unique style of street-wise naturalism is applied to a story which, in the hands of another director, could easily have been sanitized and made melodramatic. And what a risky and bold stroke of Friedkin’s to depart from years of familiarity in the cop genre. Friedkin creates pace in front of the camera and challenges himself to keep up. DOP Owen Roizman's dynamic camera is always moving. Whether its handheld, or panning around in the alleyways and tight spaces in the NYC bars, tracking behind Doyle and Russo as they walk, run, drive through the streets, the sounds and smells of the streets are palpable – run and gun cinema at it’s best. In addition to a sweep of the major Oscar hardware, Gene Hackman won well-deserved Best Actor honours. Popeye Doyle is as complicated a character as ever written in the cop genre. Though we know little about Doyle’s background, and with little exposition, or dialogue, Doyle's complexities are expressed by Hackman's instinctive reactions. Friedkin nor Doyle have the time to stop and reflect on the past, his character is defined by action. In the famous chase, Friedkin’s camera angles on Hackman driving recklessly underneath the L-Train show him as a wide-eyed, near psychotic in his pursuit of his subject –a sharp contrast to say, Steve McQueen’s reserved heroic demeanor in his chase scene in “Bullitt”. With very little dialogue Friedkin is very precise with his class metaphors. It’s never explicit but part of Doyle’s obsessiveness stems perhaps from his working class self-loathing, contrast against Charnier’s sophisticated facade. All of this is said with Fernando Rey’s sly wave to Doyle after the lengthy street and subway chase. Hackman’s performance is unheroic. The final confrontation in the abandoned building is uncompromising and powerful and rounds off a downward arc of obsessiveness for Doyle. He shoots and kills his police chief, with little regard or remorse, and then runs off into the unknown with vulnerable abandon in pursuit of Charnier. It's a supreme anti-climax for an action picture, typical of the cynicism of 70's cinema, but which retains the integrity of the story. “The French Connection” is now available in a well-transferred and produced Blu-Ray edition from 20th Century Fox Home Entertainment complete with new documentaries hosted by Friedkin himself discussing how he made the film. It’s early, but possibly the Blu-Ray release of the year.